What I have done in this section is try to add a short list of some tourist sites that I have visited in Florida while attending Grapefruit League games. For the pretty well known sites, I've just provided a link. For more obscure sites, I've also added a description. I would encourage everyone to visit a few tourist sites while on your Grapefruir League trip so that you don't get "baseball-ed out." Enjoy. 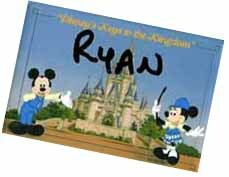 For adults and older children (16+) who want to visit Disney's Magic Kingdom, the "Key to the Kingdom" tour offers an extrememly memorable and informative experience. At $58, in addition to the cost of park admission, the tour is a bit pricey. However, it lasts a lengthy five hours, so you will be getting your money's worth. The tour will tell you and show you all the "behind the scenes" secrets of the Magic Kingdom. For example, all of the signs and store names on Main Street are references to someone who helped to build the park. You'll have the opportunity to wander the extensive underground tunnel system beneath the park, where you'll see what it takes for the characters who roam around the park to get dressed up and into make up. Also, you'll get to see the rides from a totally new perspective. Did you know that all of your favorite rides actually take place in huge wherehouses? Another interesting aspect of the tour is all of the extensive detail that goes into creating the themes of the park, and you'll also lots of Disney history. About mid-way through the tour, you'll get to eat lunch, which you order at the beginning of the tour. The guides are extremely friendsly are maintain a delightful demeanor despite being on their feet for so long every day. One bad aspect of the tour is the Disney propaganda about the staff's attitude, what it takes to work at Disney World, and that sort of thing. However, I would still reccomend this tour for those of you who are too old for Disney but still want to visit the park. It's an interesting experience and lets you see this park in a totally new way.